Dhuniya, Muhammadan cotton carders, Eastern Bengal. bl.uk > Online Gallery Home	> Online exhibitions	> Asia, Pacific and Africa Collections	> Dhuniya, Muhammadan cotton carders, Eastern Bengal. 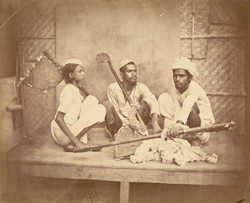 This print is one of a series of portrait studies of individuals and groups from Eastern Bengal (modern Bangladesh and Assam) taken in the 1860s. It shows a group of Muslim 'dhuniya' or cotton carders with the instruments of their trade. Although the word 'dhuniya' is Sanskrit in origin and the class Hindu, two of the men in the picture wear the skull caps of Islam. It is possible that they were taken in response to the Government of India's call for photographs representing various ethnic types from across the sub-continent.